Living on a boat, there is always something that goes wrong. And it always occurs at the least wanted time � this situation is a case in point. But sometimes, that�s the fun of living this lifestyle. When the gas runs out, it�s not like I have a gas company to call and complain to; it�s a trek down to the fuel barge to buy and fit a new gas bottle, no matter the time of day or state of my half-boiled rice. When the damn Eberspacher (see, I told you there would be many mentions of Schnebby) dies at 9pm on a literally freezing winter�s night, there�s only one thing for it� take the thing apart. There�s something very rewarding about feeling self-reliant. So when that hose pipe fitting froze and broke and presented itself as a problem, I instead saw it as an opportunity. One torch, one screwdriver, one cold pair of hands, an inquisitive dog and fifteen minutes later, I had managed to work a bodge around the broken section and had fresh water going into my tank � albeit a very slow trickle that took the best part of an hour to fill up. Now all I have to do is train my dog, Bosun, to live up to his name; surely he should have done all the fixing? But what better way to celebrate Valentine�s day than to go against the stereotypes and be a girl that can bodge things. And yes, the meal was lovely, thanks. P.S. 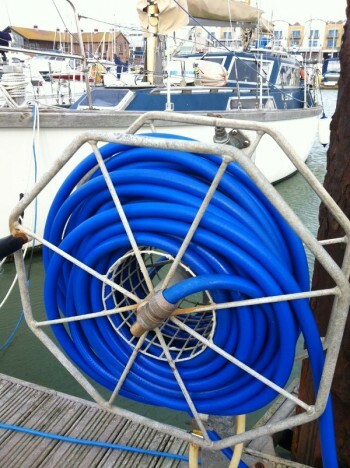 The marina fixed the hose at 8.30am the next morning. Well done on blasting another stereotype out of the water, and good luck with getting Bosun to earn his keep. We've been trying to train Grom as a PC engineer for 12 years - still no joy.